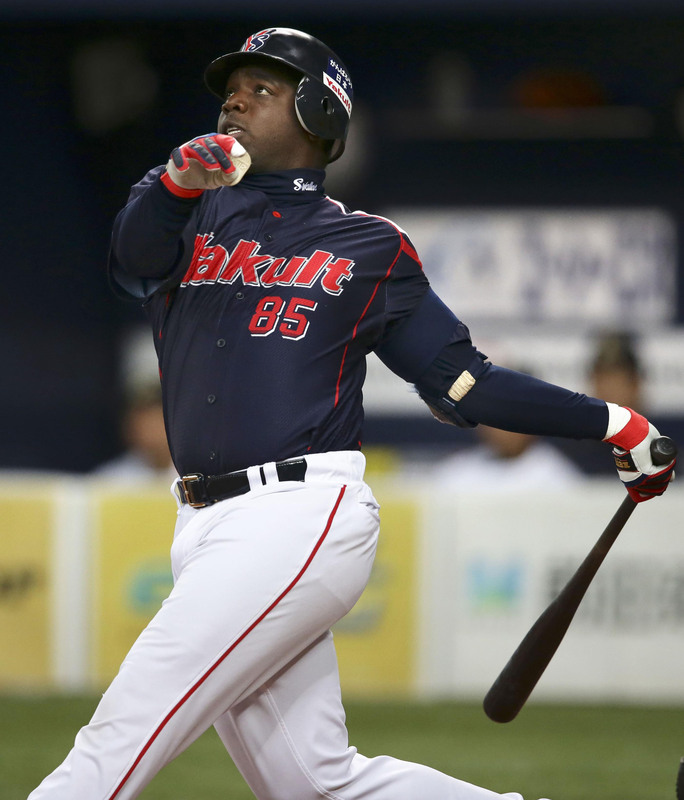 Lastings Milledge wasn’t looking for results this past weekend at Tokyo Dome, though he did have a booming home run, a double and two walks in two spring games against the Yomiuri Giants. More importantly, it was a step forward on the long road back from the injury that cost him virtually the entire 2014 season. Milledge missed all but 10 games last season because of an injury to his right shoulder. He’s worked hard to get back in shape this year and is confident he’ll be ready to go when the Tokyo Yakult Swallows open the season on March 27. Milledge had only been in spring camp a few days last year when he felt discomfort in his shoulder. He continued to play as discomfort turned into pain until it was clear he couldn’t remain on the field. 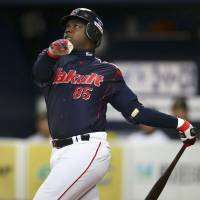 Yakult sent him to the U.S. for tests in May, and Milledge was diagnosed with a superior labral tear from anterior to posterior, which required season-ending surgery. He spent the rest of the year laboring through rehab sessions. If there was one positive from the ordeal, it’s that he was able to spend time with his family during the summer, when he’s normally away playing baseball. He relished that, but was also frustrated at not being able to get on the field. “Labrum surgery is kinda funky,” Milledge said. “You’re able to do everything after surgery. Three weeks after surgery, I was totally fine. I could do everything except overhand throws. That was the funky, crazy thing about it. It didn’t stop me from doing anything. It’s just when it’s time to throw, that’s when you know you had surgery. Milledge has been solid defensively when he’s been on the field for the Swallows, a team that has suffered more than its fair share of injuries the past two seasons. He gave Yakult a strong arm in the outfield and showed it off enough that base runners had to respect it. Now he’s working his way back to that point, while also trying to charge balls more often and cut down the distance of his throws. “I wouldn’t say I’m gun-shy, I would say I preserve my arm and make smart throws,” he said. “I have to make smart throws, at least for the first couple of weeks until I get the full confidence back. Right now, I can’t lie, I don’t have the full confidence. My arm is there, I can do the things I need to do, but to get that confidence is going to take a guy going from second to home and I throw a guy out. Milledge hit .300 with 21 home runs and 65 RBIs over 125 games in 2012. He had each of the next two seasons cut short due to injury — he was limited to 96 games in 2013 after injuring his ankle on Aug. 8 at Nagoya Dome. The Swallows could use a healthy Milledge back in the lineup and in the field, and the outfielder is going to spend the rest of the spring getting ready.